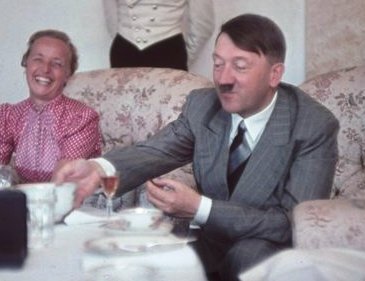 Newly unearthed photos taken in the late 1930s by Adolph Hitler's personal photographer depict der Führer's lavish lifestyle. Hitler amassed his great wealth by mastering the art of propaganda (with a ton of thuggery to back it up). Chapter Six of Hitler's autobiography Mein Kampf presents his playbook for winning friends and influencing people. "The broad masses of the people are not made up of diplomats or professors of public jurisprudence, nor simply of persons who are able to form reasoned judgment in given cases, but a vacillating crowd of human children who are constantly wavering between one idea and another." "The receptive powers of the masses are very restricted, and their understanding is feeble. On the other hand, they quickly forget. Such being the case, all effective propaganda must be confined to a few bare essentials and those must be expressed as far as possible in stereotyped formulas." "Propaganda must be limited to a few simple themes and these must be represented again and again. Here, as in innumerable other cases, perseverance is the first and most important condition of success." "[Propaganda's] purpose must be exactly that of the advertisement poster, to attract the attention of the masses and not by any means to dispense individual instructions to those who already have an educated opinion on things or who wish to form such an opinion on grounds of objective study." Hitler published Mein Kampf in 1925. The playbook hasn't changed in 87 years!